One of Christopher Columbus's ships, the Santa Maria, was his flagship. The Santa Maria was a "nao" or cargo ship. She ran aground on the island of Haiti on Christmas eve, Dec. 24, 1492. Columbus named the settlement la Navidad (Spanish for Christmas). 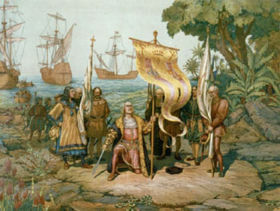 Leaving 40 men, Columbus then departed and promised to return the next year. Columbus wrote this to Spain's monarchs: "In all the world there can be no better or gentler people. Your Highnesses should feel great joy, because presently they will be Christians, and instructed in the good manners of your realms." This page was last modified on 27 June 2016, at 20:29. This page has been accessed 9,734 times.